Having an online brand is important and building your own Ecommerce website is a must for any company that wants to sell online. Never more so than when your financial security depends on it. In the last three years, online shopping has beat in-store purchasing for the first time in history. Some businesses are launching or even transferring their entire companies online, using their online store as the face of their brand in its entirety. This somewhat faceless approach means that your brand really can be whatever you envisage. With one man bands appearing alongside multi-national corporations on the same online platform. The playing field has never been more level. With so much pressure on the online store, what do you need to think about when building your eCommerce website? The average visitor spends a few seconds on your home page before deciding whether to move on to the next eCommerce website. An attractive storefront with easy to view products is key in keeping a new customers attention, and encouraging them to spend time *in* your store. Website builders such as Wix, Shopify and BigCommerce offer customizable and beautifully designed templates that mean you don’t have to be a coding expert to make the most of your new online presence. With drag and drop functionality and subscription packages which allow you to add unlimited products and images, browsing your online store can and should be easier than the real thing. Remember, customers won’t have the experience of holding your product in their hands, so good quality images are a must to provide them the next best thing. Remember to customize your website to your own unique requirements, including color scheme and logo to present a cohesive image of your brand identity. If you’re feeling technical, many web builders allow you to customize the HTML or CSS, coding your store exactly the way you want it. Take the time to consider your needs, and where your customers will be coming from. Do you want to support multiple languages and currencies for international sales? If so, ensure your website can offer these at no extra cost or damage to latency. One bad review is all it takes to lose customer faith, and when you’re dealing with sensitive data and financial details, security is key. Your website builder should offer you the very best in safety and security features, including SSL encryption for credit card data. They should also hold a high certification on the Payment Card Industry compliance tests. These tests ensure that your website is hosted by a server which maintains a secure network, protects cardholder data, regularly monitors and tests their networks, and implements strong access control measures. With this certification, all information taken via your website is known to be secure, meaning your customers can shop risk free. Make sure your website can take payments in the way you prefer, including multiple credit card options and PayPal, as choosing the right payment processor is not a decision to take lightly. It’s vital to consider the customer experience when building your own eCommerce website, even before you launch your online store. Think about how your vendor helps you attract and keep visitors, and actively gives the best user-experience to establish brand loyalty. One important feature you want included is SEO. Search Engine Optimization means that you will automatically be bumped in search engine rankings such as Google, allowing the most people possible to navigate towards your website. Most reputable website builders and hosts will include this option as standard when you make a website, and it really is a must-have, especially as a new brand looking to build a larger audience. Consider signing up to a subscription package which gives you extras to entice customers. Such as an abandoned shopping trolley feature, reminding visitors what they didn’t get round to completing purchase of the last time they were browsing. Many websites allow you to display seasonal or targeted offers on your home page, or send discount vouchers to a customer mailing list via email. To keep track of visitor interaction, choose an eCommerce vendor which provides an analytics service. Providing customer information such as the location your users come from, how long they stayed for, which pages are the most popular and data on repeat visitors. This can be used for targeted marketing and building customer relationships at a later date. Websites such as Duda allow you to tailor make your website experience for each user-base, including settings for repeat customers, specific to location, and even by each customer’s individual interests or previous purchases. Lastly, make sure to integrate your store with social media. Some packages will offer Facebook marketing, and all should offer social media widgets to help your customers share their experiences at the click of a button. 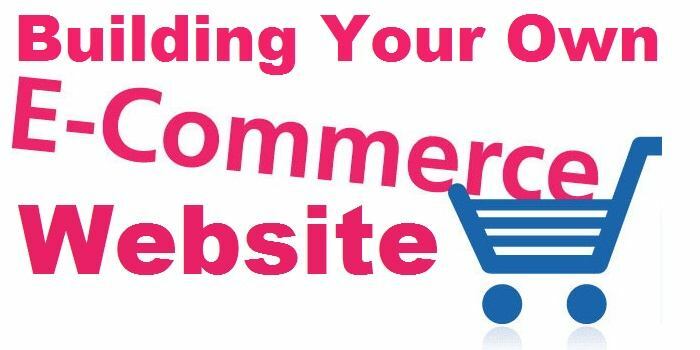 Building an eCommerce store involves careful planning. With forethought about the best design for your brand, a keen eye for safety and customer service features from the outset. You are only a few steps away from creating an effective online brand for your company when you start building your own eCommerce website.